We view social justice as an integral part of our spiritual life. Members and friends of the congregation motivated by what they’ve heard in a sermon, or guest speaker, read in our publications or seen a video on our church app report back their personal involvement in political action, Love Resists and Side With Love events. Several women participated in the National Women’s March the day after the last presidential inauguration. Timely topics are introduced on our Facebook page, in the WednesdayUPDATE, and are often the focus of our morning assemblies. 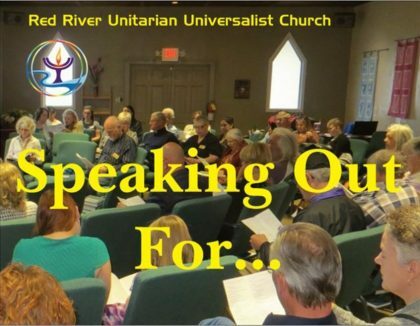 Articles about social justice efforts being made by the Unitarian Universalist Association, the UU Service Committee, the Texas UU Justice Ministry and the Southern Region are included in Red River Ramblings. We’ve printed postcards “Speaking Out For …” that people can send to their elected representatives offering a UU perspective on current issues. We received a grant from the UU Grants Panel for two banners promoting Get Out The Vote and have staffed voting drives at local events. We also lend our banners to other groups for their use in getting people to register to vote. Members join NTUUC in participating in the UU Day at the Legislature. Each in our own way – some small, other large – being able to put our seven principles into live action is important. We feel our efforts are important.